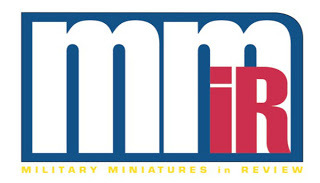 Military Miniatures in Review – or MMiR is the magazine released pretty much every two months from Ampersand Publishing – the same people behind the Allied/ Axis books amongst many others. Each issue is a soft glossy cover of around eighty pages and featuring news, reviews and several model builds and tuitions as well as a walk around of a vehicle that is in focus at that time. Although I can never work out the regular time this magazine comes out I do look forward to reading the newest edition of MMiR. I’m happy to say that No #62 is more of that off the cuff feel to it - through reading the editorial and the honest style of writing from the authors of each article you can perceive a real sense of humour and a loose editorial style that I this works well with such a “serious” subject as modelling plastic to look like the real thing. The other thing I like is the limited use of clichés in reviews and builds. You all know them – “A nice touch” and “crisp” and the prominent over showing of pints and materials almost just as a marketing tool. This magazine concentrates on modelling rather than personal status of the modeller it is nice not to have to know who the editor is before I can read a model build. Let’s get serious about what you get in this mag. There are eighty pages inside the thick glossy cover A4 portrait format. There are some adverts in this mag but not as bad as many you see. They are mostly at the start and the rear of the magazine and they do not encroach into the articles themselves which is nice. The magazine sells for US$9.95 which is a fair ground between the more expensive ones and the cheaper add filled magazines. The magazine starts each issue with six pages of industry news from many well-known brands of models and aftermarket. There is a lot of material here though for people not prone to gathering news themselves. There is interesting stuff here but all too brief in the space provided. Next are two pages of book reviews – featuring nine books in this part again you could be forgiven for not getting much in there. The books look interesting though and the general contents is described succinctly. Problem is that these are only cursory. Maybe an in depth product preview of one or half a page view could be better served here? I am not a book publisher though so this is just my view of these pages and what can be done there. It’s too brief for me. 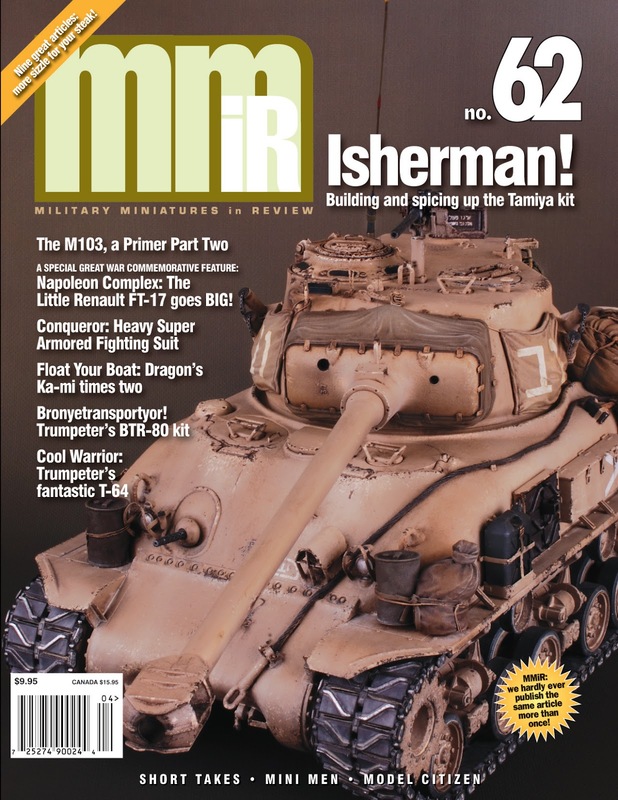 We get back to the stock in trade of Ampersand next - a proper walk around and pictorial education of the M103 tank - “A Primer: Part 2” – shows five pages of walkaround images of not only US but German marked tanks from many museums around the world. Great pictures, well lit and a handy to have on hand if you want to make this tank - these are matched by informative text for each picture. Tom’s SBS article is accompanied by French text and each of these chapters has a French title – nice, as well as the picture of the real thing back in olden times which I love to see. All of this put together with what we have mentioned make this a great build and article. Next we look at something for the meccha-Sci-fi crowd - Conqueror: Heavy Super Armored Fighting Suit shows the build of a futuristic suit made from the machinenkrueger.com website, Mr Bryan Krueger. This build of a HSAFS (Heavy Super Armoured Fighting Suit) shows an interesting side of modelling that has forged a real niche in modelling and a crossover for figure/ ship and tank builders to dabble in. It seems from reading this the rules are just as set for a model like this and it is interesting to see that just as much effort, scratchbuilding and detail goes into this as there would be a well-known fighter aircraft or tank. Next there is a double build of Japanese amphibious AFV’s in Float Your Boat: Dragon's Ka-mi times two. This is a double build of sorts showing a “Vanilla” tanks and the cousin of this AFV with inflatable pontoons that the Japanese used in the pacific. The next build is a very nice little Trumpeter’s BTR-80 kit build called "Bronyetransportyor!" The SFOR personnel peacekeeper is seen detailed up both inside and out in the SBS and paragraph style that is seen throughout this magazine. We spend a fair bit of time on the internals of the vehicles which may not be of much help to some modellers but it is nice to see here. Often this is overlooked in the rush to publish a kit review so great work on the modelling and story throughout. Now what I really do not care for too much is the Sherman tank- sorry but I said it – but this article on the very late marque model with a 105mm gun and updated suspension. This Israeli boxing of the Tamiya kit is updated with Voyager stowage (lots of it) with some other extra gear make this tank a little top heavy but all the better detailed! The problem – and the only problem with this article is that there is only six pages of it. More than half of this is taken up with pictures and although pictures are good there could be more description, more step by step and less paragraphs of text in there. Next we look at the menacing kit of the T-64 from Trumpeter in “Cool Warrior.” This build is not only of the Trumpeter kit but the Vallejo paint set of Cold War Russian colours as well. The paint looks like it worked really well and the end product is a very cool looking and believable kit. Lastly we have a great little tutorial called “Model Citizen: SK Miniatures German Infantryman WW2” features an SBS of just how to paint not only the face but the uniform, equipment and personals. If you subscribe to this painting style or not a guide like this always teaches you something. These builds are better either as a step by step or a text and pictures build, not both – as it does take the focus away from what is going on every time you turn the page and you are never sure to read the captioned pictures or the block text. The other thing is the review/ previews section at the front. Instead of this and the adverts why don’t we raise the price a few bucks and go more in-depth? Competition is tough and this is one way i would think of to compete. Again I do not publish magazines so I might have the wrong ideas. The builds in here are very nicely done and all competition winners, the editorial and writing style is light and humorous and easy to read. I like this magazine very much and it is a good read. Thanks to Ampersand for sending this mag to us - It is available from Ampersand’s distributors or direct. MMiR @11 provides a quick and easy way to get your favourite magazine delivered right to your front door—via first class—for only $1.05 postage. This first class delivery option is open to any resident of the United States. Customers are charged just $11.00 for each issue, three days before mailing. There is no cost to sign up and no long-term obligation. Orders are only charged when they are ready to ship! Order a single issue, or many. Keep receiving MMiR for as long as you’d like and cancel anytime.